On Sunday morning, March 6, 2016 I awoke from my dream state and rolled over to scribble down an idea I had onto a notebook that I keep beside the bed for just such occasions. The paper and pen are there for those rare lucid moments when my thoughts are crystal clear. The precious seconds when that elusive and fickle goddess we creative people call "Muse" pays me a visit between my dreaming and waking moments at the break of day. This time she brought me the "2016 Republican National Convention Riot T-Shirt idea." I had to answer her. I scribbled out some sketches and phrases and then made my way groggily to the computer in my office to catch and contain this lightning in a bottle. Within 20 minutes of sitting down in front of my computer screen I had the rough ideas down. I sent out a few thumbnail sketches to a few friends who have helped me in the past, but they passed on my latest offer for graphic design work. Frustrated, and knowing what I had, I did it myself! And the rest, as they say, is history. A few weeks later and within 45 minutes of posting the images and "Riot" idea on Facebook, I had sold a half dozen shirts. Within 24 hours I had sold 50 shirts! And as word spread the sales continued to climb. You cannot argue with a reaction like that to a T-shirt! I trusted my gut and now we have sold several hundred shirts within a few days of release and there is no end in sight! I have been doing interviews and filling orders round the clock as this takes off. This is not my first foray into the t-shirt business though. I had huge success in 2010 with the Lebron James "Quitness" t-shirts that I created, copyrighted and sold prior to his announcement that he was leaving Cleveland for Miami. I actually had that idea and image copyrighted months before when Lebron seemed to have given up on the court against Boston on national television. His astonishing throwing in of the towel that night gave birth to "Quitness." Those shirts sold several thousand units in a very short time. Prior to the Quitness victory, I had success with my "Goosenecks" shirt design inspired by the Cleveland Cavaliers three point hand signal that the players were making after swishing field goals on the hardwood. Undaunted by the fact that the Cav's passed up on my copyrighted "Goosenecks" image, I went on to sell respectable numbers of those shirts on my own as well. But this, my third shirt, seems to be the charm. It is poised to surpass both of those previous forays into the t-shirt market tenfold! I know the ropes now! I have been here before. I am able to navigate the surprisingly competitive and cut-throat t-shirt market with great dexterity and ease. Plus, this is such a hot topic and source for debate the shirts are literally selling themselves! Trump and the threat of riots in Cleveland are clearly polarizing and push-button topics on both sides of the equation. And I have now found myself simultaneously deflecting detractors and accepting congratulatory messages from the supporters who are buying the shirts as fast as we can print them up. I am not condoning nor even advocating for a riot in my beloved city. I am however, in typical Clevelander fashion, poking fun at the whole mess. This is truly one of THE MOST appalling and embarrassing Presidential Election cycles in recent memory. The fact that the Republican leader in the race did not and would not discourage a riot by his minions is both appalling and frightening. And, while I neither support nor agree with him or his followers, I do think they have a right to be angry. If the powers that be want to move the goalposts as he is nearing the end zone, they have a right to be peeved. The system is so broke that perhaps only dissent, anger, animosity, and yes, maybe even riots in the streets, will bring about the reform and change that is so desperately needed. I empathize with them. I am not encouraging them. They scare the hell out of me. He scares me. This entire devolution of our society scares me beyond words. I mean how do I even begin to explain this to my eight-year-old daughter? You cannot explain this to her. It makes no sense. But I digress. I hope they don't destroy our city. I hope it is all kept cool and I hope that common sense can prevail. However, based on what we are all witnessing play out over the past few months, I don't see that happening. So, as a result, I am cashing in. I am backing my t-shirt truck up to the vault doors and taking the money. That is, after all, the Trump way, isn't it! I am going to capitalize on this amazing opportunity that was handed to me as a creative Clevelander. I am P.T. Barnum to the circus that is rolling into town! I am selling the popcorn, cotton candy, programs and t-shirts to the spectacle that has been building and growing and gaining in momentum like a hunchback doing somersaults downhill, on loose soil ever since he announced his candidacy. Now it is out of control! And while there are strong feelings on both sides of the issue, one thing is clear, there is a demand for this type of commentary and humor. And the demand is not just from Clevelanders either. I am shipping shirts to Wisconsin, Maine, Michigan, Vermont, Florida and all over! The word has gotten out and voters and Americans everywhere seem to be placing their tongues firmly in their cheeks along with me and most other Clevelanders. People from Cleveland have a certain indiscernable, self effacing kind of humor and pride that only we locals can understand. Like the river burning and the Nickel Beer Night Riots, this too shall go down as a historic moment in this town. Thanks to my Muse, I have the fortunate distinction of cashing in on it before and during the event as opposed to after the fact. So, hate the system. Hate the party that is changing the rules. Hate the rioters. Hate the fact that the leader is not trying to quell the riots, but don't hate me for seeing an opportunity and seizing it. Hey, this is my Trump Tower. Like Trump, I have built my castle made of sand on a garbage heap and I'm gonna cash in. 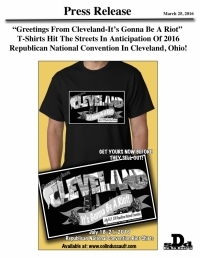 The only difference between me and the guys that are creating and selling "Nickel Beer Night" commemorative T-Shirts and "Burning River" images so many years after the fact, is that I am doing it ahead of and during the tragedy that we call the 2016 RNC in Cleveland, Ohio. Colin Dussault is a Musician/Bandleader from Lakewood, Ohio.